A shoe lover’s paradise, an exhibition now on display at the Long Island Museum in Stony Brook presents a wide variety of stylish shoes and boots as works of art. In the show, “Beth Levine: The First Lady of Shoes,” fashionable footwear perches on platforms and ledges, nestles within glass cases and even dangles from the ceiling. As visitors wander around, they may hear Nancy Sinatra singing “These Boots Are Made for Walkin’ ” in a clip that is part of a video about Ms. Levine. The sleek white go-go boots that Ms. Sinatra often wore when performing that 1966 hit were designed by Ms. Levine, who died in 2006 at age 91. The boots became so popular that Saks Fifth Avenue opened a special section in its shoe department for Levine designs called Beth’s Bootery. Ms. Levine’s comfortable pumps — and sometimes her boots as well — were worn by four first ladies: Mamie Eisenhower, Pat Nixon, Lady Bird Johnson and Jacqueline Kennedy, for whom the designer made thigh-high burlap boots with stacked heels and many of the smart flats that were part of what became Ms. Kennedy’s signature style. Ms. Levine’s celebrity clients included Lauren Bacall, Ava Gardner, Liza Minnelli, Marilyn Monroe and Barbra Streisand. She also made shoes and boots for Broadway shows and for Braniff International Airways flight attendants (Emilio Pucci designed the rest of their outfits). 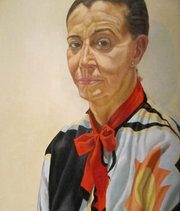 A portrait of Beth Levine by Philip Pearlstein. Among the many innovations she introduced, Ms. Verin said, were the first stiletto heels, in 1949. In 1953, Ms. Verin noted, Ms. Levine designed the first backless shoes with “Spring-O-Laters” in the soles to help keep them on the wearer’s foot, and the first white midcalf kidskin boots (thoughAndré Courrèges is often credited with creating the style 11 years later). But her greatest contribution to footwear design, Ms. Verin said, was transforming the lowly boot into a haute-couture fashion item. Ms. Levine was known as Bessie Katz when she was growing up as the third of five children born to Israel and Anna Katz, both of whom were Lithuanian immigrants, and throughout her life often identified herself as a “farmer’s daughter,” Ms. Verin said. Katz family photos are part of the exhibition, too, along with dozens of ornaments that did not make it onto her shoes. Ms. Levine’s connection to nature shows up in several of her designs. One, called the “Butterfly Boot,” which she created in 1971, is covered in butterflies embroidered in silk on linen. Even more whimsical is her “Barefoot in the Grass” sandal of 1966, which uses AstroTurf as its insole. Ms. Levine once explained that “the grass goes with you” when you wear it. Other unusual designs stray far from Ms. Levine’s farmyard roots. Her “Moon Shoe,” made in 1968, uses reflective silver vinyl to give it a space-exploration look. “Paper Twist” (1967) was constructed of laminated paper strips. The farmer’s daughter came to footwear fashion in a roundabout way, Ms. Verin said. She moved to New York City in 1938, intending to study social work. To earn money to pay for school, she got a job as a foot model, ideal for her because she wore a 4B shoe, the standard sample size at the time. Before long, she started to make suggestions about fit and comfort, though they were often unwelcome in the male-dominated industry. In 1946, while looking for a better job, she met Herbert Levine, a Dartmouth graduate who worked in sales and advertising at a shoe company. They married a few months later and, in 1948, bought a factory and opened Herbert Levine Inc. Attaching a male name to the brand made it more acceptable in the trade at the time, Ms. Verin said. Ms. Levine never had any formal design training (though, thanks to her farm background, she was familiar with different kinds of leather.) She is quoted in a wall text as having said: “Dressing is like cooking — you taste. I learned by doing.” She tried on all her shoe designs herself, often making adjustments to increase their comfort. “Comfort IS fashionable!” another wall text quote exclaims. A transparent vinyl pump on display as part of the exhibition looks as though feet would sweat inside. How could that be comfortable? Ms. Verin pointed to nearly invisible holes that allow air to circulate. And those very pointy shoes — they look painful. Not so, said Ms. Verin, who owns many of the shoes in the exhibition and has tried on a few of them: They don’t get really narrow until after they clear the toes, so feet don’t get squeezed. In other words, despite their fancy pedigree, these shoes were made for walkin’.